Topics: Radiator Pressure Caps, Filler Necks, Concentric Oil Coolers, Inlet/outlet Pipes, and Quality Assurance. aashirvad.com Radiator Filler Necks - Products - Aashirvad Auto Tech (Guj.) P. Ltd.
aashirvad.com Contacts - Aashirvad Auto Tech (Guj.) P. Ltd.
aashirvad.com About Us - Aashirvad Auto Tech (Guj.) 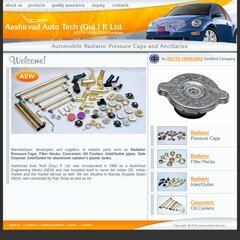 P. Ltd.
aashirvad.com Radiator Pressure Caps - Products - Aashirvad Auto Tech (Guj.) P. Ltd.
Its 2 nameservers are ns1.globushost.com, and ns2.globushost.com. Aashirvad.com's IP address is 173.248.143.35. It is hosted by Wehostwebsites.com (Colorado, Denver,) using Apache/2 web server. PING (173.248.143.35) 56(84) bytes of data. A ping speed test response, is timed at 14.5 ms.